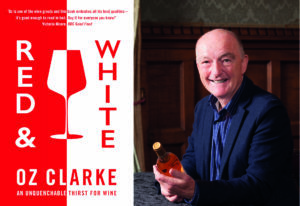 Oz Clarke’s Red & White. This is a book to read for pleasure, rather than merely refer to. Combining fast-paced, witty memoir with passionately opinionated guide, Oz pops the cork on his life-long love affair with wine. Sniff, sip and swill, with the ideal drinking companion as he explains why he fell in love with wine, how to enjoy wine – whatever the budget – and be inspired by Oz’s encyclopaedic knowledge and inimitable zeal. Bottoms up! Come and join wine expert and bon viveur, Oz Clarke for an evening of wit, wine and conversation. Enjoy lunch and a glass of wine whilst Oz pops the cork on his life-long love affair with wine and signs copies of his latest book, Red & White – a fast-paced witty memoir and passionately opinionated guide to his favourite drink. In partnership with Chesters Wine Merchants, Book-ish Bookshop welcome Oz to discuss his new memoir and wine guide Red & White. Wine tasting, in association with Corkage. Join Oz Clarke in conversation with Nina Caplan, the New Statesman wine columnist and author of The Wandering Vine: Wine, The Romans and Me. Join Village Books for an evening of wine tasting with Oz Clarke, one of the world’s leading wine experts.